In celebration of Decked! getting 100 subscribers on YouTube — thank you everyone who’s been following along, commenting, and sharing the game play goodness out there — we’re doing something a little different this week: Decked! Tech. Ray builds a deck live on tape for you, from his initial notion to weeding through all the possible cards to whittling down to a final fifty. Bear in mind this is an initial draft list, which we will test and come back with revisions. For this inaugural session of Decked! Tech, Ray starts with Lodge Barkeep. One of the more tantalizing entries in Call of Cthulhu‘s card pool, the Barkeep is cross-faction steadfast. He’s a Silver Twilight character that requires a Syndicate resource on one of its owner’s domain to play, and brings an exhaustion trick to the Silver Twilight faction. You could say the deck builds itself, but Ray makes some discoveries along the way that keep things interesting. Subscribe to Decked! on YouTube and be the first to know when the testing session hits! And if we get to 200 subscribers, Ray’s already committed to building a Zoog deck for your entertainment, so that should be interesting. Sharp-eared viewers may note that while recording, Ray initially dubbed this deck “I’ll Have What He’s Having.” Almost immediately after recording, Ray said, “I should have called it ‘Lock, Stock and Two . . . something. '” And thus the deck name you see today. 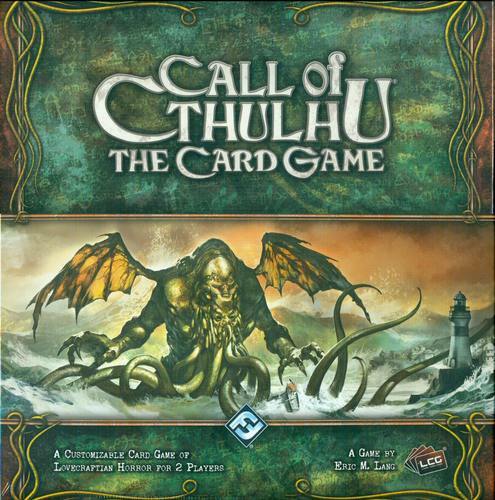 The Call of Cthulhu: The Card Game scene has been picking up in Vermont in the past couple months. First Black Moon Games started hosting events, and now Brap’s Magic here in Burlington, as the last few Decked! videos have noted. My process for developing this deck started with a comment by Carthoris on CardGameDB.com: “A ‘School Bells’ deck could use 0-cost Miskatonic weenies to power the Sound of the Dark, and Untimely Burial to make sure you have some desirable powerhouse to awaken.” If you check out the very first draft of School Bells, you’ll see all those cards, plus a motley assortment of Dark Young who key off entering or leaving play. The first time out with that iteration of School Bells was miserable, success-wise. Going across a Syndicate deck of Criminal buffing and skill manipulation and a traditional Yog-Sothoth mill deck, I think I came close to winning one match, and the remaining two or three were handy defeats without a single story won on my side. And while that evening was one of failure, I did my best to use it as a rich learning experience. “Fail fast,” as some people hold, and fail forward. Intentionally playing a lot of quick games let me see which cards worked, which didn’t and what elements were missing. Also, I was fortunate to have Carlo on my side, who recently returned to the game. He’s the tinkering sort of deckbuilder, whereas I want to slap some cards together and see what sticks during field testing. Between playing against him and bouncing emails back and forth, his feedback and suggestions guided much of where this deck went. Immediately from the first revision, the deck took a hard left, dropping all the Miskatonic cards. My intent with them, beyond sacrificial fodder for the Three Bells, was to draw extra cards and float useful things to the top of the deck fast. Instead, the next version gave up draw and manipulating struggles for resource building and slowing down rush tactics with the Festival and Negotium Perambulans in Tenebris, which enables the powerhouse Savio Corvi. The Three Bells went after that. While it can be handy, in the deck’s configuration at the time, it was just too slow and costly for a “sacrifice your worst character” effect on the other player. Instead, Plague Stone is the go-to weapon of mass character destruction, with the Mage Known as Magnus providing targeted character removal. At one point, the deck’s only additional draw was Thunder in the East. Book of Iod came in to fill that gap, and fill the discard with candidates for Dark Rebirth. It still feels slow, but while Shub-Niggurath has effects that skim character subtypes off the top of the deck into your hand, none of them really work for this particular character line-up. I felt I did pretty well at the Brap’s Magic event with this deck. We had a round robin of four players, and I won two of my three games. There are still some changes I would make, like dropping Ia! Ia! Shudde M’ell, though I haven’t decided what would take its place. And the deck is really lacking in event and support recovery. Once those three Thunders in the Easts are gone, they’re gone. I’d love an in-faction card recycling mechanic that isn’t as costly, random or slow as The Stone on the Peak. With The Thousand Young out now, I could try revising this deck, but I feel like I’d wind up building it up from the ground all over again, just to avoid choosing the same 48 cards as before, and then only having two slots for new stuff. That said, French Quarter seems like an easy thing to try out here, and it would provide some additional information on how to use Book of Iod most effectively. The Bad Publicity show did something pretty neat this week: viewers voted on cards for the hosts to build a deck around. Theophilius Bagbiter, one of the most improbably-named cards in Netrunner, became the centerpiece of a deck, which they promptly took out onto an unsuspecting OCTGN population. As a companion to this week’s episode of Decked!, here’s the mono Hastur deck Ray designed, and which I played a variant of. At the time it was built, the available cards didn’t include the “rare” Dreamlands cards like Keeper of Dreams, so he subbed in Victoria’s Protege, among others. Please bear in mind this is one of Ray’s first two Call of Cthulhu decks he ever built, so it’s presented primarily as an example of a starting point in deck design. As you can see in the Decked! video, Ray’s designing new decks with new tricks, like Henry Knoll outsmarting everybody under the sun, monstrous or not. In playing the deck, I was most interested to experiment with The Thing Behind You as a bouncing mechanism for characters with enters-play effects, like Victoria Glasser. I only got to do it once, but getting to retrigger an effect like that and put out a beefier character in one action is pretty appealing. If I were to take inspiration from this deck, I think I’d want to focus more on the enter-play effects, taking advantage of Bloated Leng Spider and Victoria Glasser, as well as adding in some more take-control effects, and shifting from cards that mill the top of the opponent’s deck to reducing their options in hand more aggressively. As promised, here is the second version of the Rituals of the Order deck I posted last week. Stripping out the rituals and cards that worked with them them — Magic Theorist to add extra tokens based on the tomes in play and discard effects like Dedicated Butler and Sigil of the Order to get high cost characters into the discard pile — left me something like 11 slots in the deck to fill. At one point in the revision process, I was agonizing over which of two cards to add, because I knew I was up against the 51-52 overage, and then discovered I was more like eight cards away from 50. That was practically permission to experiment freely with interesting events that I wouldn’t normally have considered. Fine Dining, Fleeting Guise, Mind Swap and Secret Handshake are all events I decided to experiment with. In my few plays so far, Secret Handshake proved really clutch in several instances, as it’s a cheap boost to a Silver Twilight character, and can be pulled back from the discard with T’kta Halot, along with many of the rest of this deck’s events. Fine Dining is also a fun one-two with Professor Peaslee: swap characters with your fellow player, then wait for the right moment — possibly when you’ve faked them into committing to a story you don’t especially care about — to literally feed the traded character to someone for a healthy swathe of icons and invulnerability when they least expect it. It’s not really Call of Cthulhu if people aren’t struggling with lost knowledge that ought to have remain lost, so I wanted to stick with Sarah Van Shaw and Chauncey Swann as characters who benefit from the presence of tome support cards. Although looking at the deck list again, at the same time I ditched most of the tome cards that would boost them. So that’s going to need further tweaking. I’ve been really annoyed that Silver Twilight only has two tomes of their own, and Yog-Sothoth’s are not great that I can see at the moment. I’ll have to work on that more, because Sarah’s a champ when she’s got a book in hand. Chauncey less so, though I certainly do enough bouncing to hand with the Initiate of Huang Hun that I ought to be taking advantage of those opportunities to sift for support cards. More than half of the supports in this deck are Silver Twilight, so it’s probably worthwhile, although might not be more if I do increase the number of tomes. The John Dee Necronomicon has a lackluster effect, so I’d be looking to Yog-Sothoth’s tomes, which are more plentiful, at least. Zanni’s another recent addition I’m less confident about. Maybe it’s a lack of practice, but in the few plays so far, I’ve found myself forgetting to use him when appropriate, then glaring at him in annoyance on the occasions when I did notice him and he would not be helpful. He has an interesting effect, forcing extra characters to a story. I’m guessing he’s meant to be a sacrificial lamb, possibly one that unexpectedly grows into a beast, and that’s a mindset I’m still learning to make use of when appropriate. Normally, I play very conservatively, reluctant to lose characters and resources. But as one person likes to point out, “The winner has three story cards, not the most characters still alive.” It’s just finding the ways to make sacrificing a character for the block productive, rather than a waste. I’m still working on that for now. With this Call of Cthulhu deck combining Yog-Sothoth with the Order of the Silver Twilight, let’s see how playtesting informs an iterative design process. The original idea was two-part. First, use the Order’s self-discard effects — Sigil of the Order, Dedicated Butler, Unbound! — in combination with Yog-Sothoth’s self-milling effects, particularly the Lost Oracle, to seed the discard with characters. Then, use Magical Theorist to accelerate the number of tokens going on Rite of the Silver Key to play characters from the discard, as well as destroy the other player’s characters with Ritual of the Construct. Meanwhile, the same tomes that are giving the Magical Theorist his oomph are also buffing Sarah Van Shaw, Chauncey Swan as well as whomever happens to be carrying them. To be clear, I don’t recommend this deck at all. I’m sharing my learning process with these posts. That was the idea. In playing the deck, what generally happened was Ritual of the Construct and Magical Theorist were almost always resourced to pay for more immediately useful effects, like Faceless Abductor and Initiate of Huang Hun to bounce characters back to their owner’s hand — both mine and the other player’s, because clearing a character of the burden of Frozen Time or the Black is pretty keen — and the Guardian of Dawn backed by Hermetic Seal activating her Day bonuses. There’s a very good argument that while the Initiate is useful, draining all of one’s domains to bounce three characters keeps you from getting any more characters out, or having the option to play non-zero cost effects for the remainder of your turn and the whole of the other player’s. This deck also had a paucity of events to play, so maybe that didn’t bother me as much as it should have, although I often felt hampered by the lack of any abilities to use that weren’t already on the table. Dark Passenger also proved useful both for playing higher cost characters a little earlier, and making the other player a little more reticent about committing their afflicted character. Lost Oracle also did a bang-up job slowing down the success token race. I can’t say whether I used T’tka Halot to retrieve any milled rituals or spells more than maybe once. The John Dee Necronomicon was a dud card, basically there because I wanted to have tomes to keep Sarah and Chauncey happy and Silver Twilight only has those two volumes, period. The initial draft of this deck also included Yog-Sothoth, In Whom the Spheres Meet. The hope was to have multiple paths to play Yog-Sothoth early, either through the Rite of the Silver Gate, or by the number of spells in the discard pile. Neither turned out to be very realistic, so I cut him early on, probably in favor of cheaper characters to play early on. When the deck worked, it worked. But I felt like I was only using a portion of the cards. Magical Theorist and the rituals themselves were almost always the first candidates to become resources. Next time, I’ll post a revised version. The sneak peek is I cut out most of the discard from hand effects, and dropped the emphasis on rituals. They’re a sideline effort that took up too much time and resources. What’s the sense is spending time setting up rituals and feeding them while your opposing player is sending characters to stories and scoring tokens at will? As mentioned earlier, here’s my pass at a Deep Ones deck intended to introduce Call of Cthulhu to a new player. Two players have tried it so far. They both definitely got it and had positive play experiences — I hope in part because I’m learning to be more mindful of pointing out the connections between cards, such as the various ways to play Cthulhu earlier or more cheaply — but I think the deck still needs work. One of the players remarked it was pretty basic: play Deep Ones, go to stories, maybe sacrifice some chumps to off the other player’s characters with the Khopesh of the Abyss, or feed to Carl Stanford. Additionally, he pointed out there weren’t a lot of beefier characters, aside from Cthulhu and Deep One Rising. That’s in part because there’s a paucity of higher cost Deep Ones — Robert Friendly excluded — and maybe my bias leans toward more characters that can be played earlier in the game. It does leave one short on stronger game finishers. When I revamp this, I’ll have to be less discriminating against Cthulhu faction characters who aren’t Deep Ones. When Toby played this deck, we got to battle back and forth for Day and Night a bit, which was a change. Usually, it seems that one player prepares for one side of that game state because it specifically benefits the deck, and the odds of it becoming a point of contention are minimal. With San Giorgio in Alga, though, the Deep Ones player is motivated to keep it Night for the deck-filtering effect. And when against Company Men, they’re motivated to keep the fight up or various Agency buffs kick into gear. That particular Agency-Cthulhu pairing caused Communal Showers to fizzle, too. It’s primarily useful against the typical multi-faction mix. When you go mono a mono, as it were, its utility is nil. Probably worth replacing with a more broadly useful support card. I think the same is true of Solar Eclipse. It’s a neat event, and can make a Deep One unexpectedly terrifying, but I’m not sure it has enough utility. Any time I’ve seen it come into my hand, it sits there for the duration of the game, or gets resourced, so I can play something more interesting or immediately applicable.